The Alliance for The Chesapeake Bay is only one week away from hosting our Wild & Scenic Film Festival in all four of our locations! 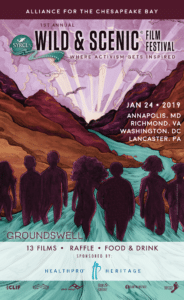 You’re invited to join us for our Wild & Scenic Film Festival in Annapolis, MD; Washington, DC; Lancaster, PA; and Richmond, VA on January 24th! Each location will be showing the same 13 short films about nature, community activism, adventure, conservation, water, wildlife, environmental justice, and indigenous cultures. Click here for a sneak peak!